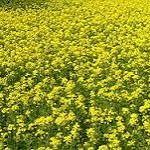 Green manures are particular plants which are grown to improve the structure and/or the fertility of the soil. They break up heavy soils and improve drainage, and can help light soils hold more water. Different green manures have roots of differing depths. These can mine for different minerals in the soil, bring them to the surface and keep them there. Green manures of the Legume family increase Nitrogen in the soil which will be available to the following crop in the form of nitrates. Some, such as Alfalfa, root down very deep and bring up minerals to the top layer of the soil. The green tops of Green manures, when dug in, add humus and nutrients. A quick-growing Green manure such as Mustard can be sown mid-season before sowing a second vegetable crop on that patch of ground. 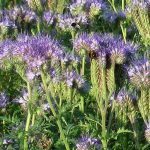 Sow a Green manure that will keep the ground covered and protected over the winter (such as Red Clover, Alfalfa, Vetch (Tares), or Phacelia). This will help prevent the leaching of nutrients during the winter months. The plants can then be dug into the soil in March. 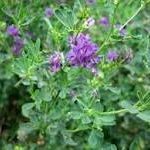 On an allotment, Red Clover or Alfalfa can be sown in rows widely spaced, clipped several times a season to stop them from flowering, and a crop can be grown between these rows. The Green manure clippings then form a good mulch to maintain moisture, while at the same time their roots are ‘feeding’ the growing crop.